2 bedroom chalet for 5 persons in a quiet area. Luxury chalet in the mountains with lots of privacy and with every comfort. but just to say what to expect. You can find all of this in the facilities. From 22 December 2018 I start with even more service. All beds will be made up so that you do not have to do this yourself immediately after a tiring journey. There is 1 box of fireplace wood ready so that you can immediately enjoy the winter on arrival while enjoying a delicious glass of wine cozy by the fire. How nice to start your holiday and of course there is a bottle of wine ready to welcome you. This is all included in the rent! La Monta is a small town in the mountains of Switzerland. Because of the location of the chalet at about 1800 - 1900 meters altitude, you have a beautiful view over the valley and the mountains. A truly romantic place a short distance from the center of Arolla and 15 minutes from Evolene ski area and 35 minutes drive from Sion. A wonderful city to go shopping or to grab a terrace. The cozy chalet is equipped with all the luxury and located in a very quiet area. In winter this area is ideal for skiing and cross country skiing. A cross-country ski run is 50 meters from the front door and the ski slope is 600 meters from the road. In the summer the area is ideally suited for mountaineering and there are many routes for hiking. From the upper floor and the bedrooms on the ground floor, this chalet has a magnificent view. The living room with patio doors to the balcony is located on the second floor. The living room has a fireplace and is equipped with a flat screen, DVD player, video player and a CD player with radio. To make it even more enjoyable, there are films available, a wide collection of music from classical to lounge and various books, if you want to read during your stay. On the ground floor there are two bedrooms. A room with a double bed and doors to the terrace with a magnificent view of the mountains. The second bedroom has 3 beds, of which a bed is foldable. There are wonderful duvets for both summer and winter with comfortable cushions. There are also other types of pillows available to make it as comfortable as possible for you. Linen can be rented from us. The ground floor also has a bathroom with bath and a separate shower room. My name is Marilyn de Bois and I am the owner of Chalet Bams. I am married and a proud mother of two beautiful daughters. This Chalet belonged to my aunt and am so happy and proud that I can call myself owner because as a nice memory of my aunt. Yvonne Bams was her name and she lived for the mountains. She has climbed the mountains until she was 70 with so much passion! Of course always in the company of a guide. On one of the mountains there is a bench placed with her name on it to honor her. She was actually a legend in Arolla. That is why I named her chalet after her. I work as a stewardess at KLM and am so happy to occasionally not to be in the air, but to stay in the mountains without having to use an airline to visit this beautiful oases in the mountains. Because of my experience of staying at sometimes 5 star hotels, I found it absolutely a must to offer my chalet as comfortable as possible. It is important to me that everything is perfectly maintained, is clean, and of course the necessary luxurious comfort is present. I therefore hope that, just as I do every time, can fully enjoy it. I really wanted to keep chalet Bams in the family. My brothers and sister, however, were not interested, so I took over her chalet myself. The environment is so beautiful and soothing. In the winter I enjoy the cross-country ski run that is right outside my door. I also love to sit on my balcony enjoying the sun that will shine around 10:00 in the morning. My chalet is facing the south what is so there will be full up sun during the day. In the summer I enjoy the beautiful greenery that appears everywhere, and the walks that I can make around my chalet. The sound of the cows with the bells they wear around their neck makes me realize what wonderful it is to be allowed to stay in this nature. My chalet is on a river that you can see when you look down. The wonderful sound of the water flowing from the mountains sounds like music to my ears. A small stream runs down my terrace. So actually I also have a mini river running in front of my terrace. My plans are therefore stay longer periods in my chalet in the future. I call it my little paradise on this earth. The peace that la Monta radiates is a gift for me. As a small child, I visited my aunt every year with my mother and brothers and sister. In the next couple of years, I visited her with with my family. The moment I open the door of my chalet, one can smell the wood. And then I know for sure, I'm home again. After unpacking, my husband and I are sitting at the balcony to enjoy the view and the sun and a delicious glass of wine. When it gets colder a little later we light the fireplace and enjoy the warmth and the sound of the crackling wood, in our cozy living room. Because there is an open kitchen, my husband and our daughters can sit at the bar for a cozy drink while I prepare the food. When it is time to go to bed we close the shutters and are already looking forward to being able to open them again in order to enjoy the beautiful view again. In the master bedroom there are two French doors that provide access to the terrace. I always open these doors in the morning and enjoy the beautiful view of the mountains while enjoying a delicious cup of tea. In the summer it is a treat to light the barbecue. I have had a large barbecue built so that all plates and meat can be placed on it. For groceries shopping you can go to Arolla, or after a short drive at the Coop in Evolène. Do you really want a day out, then you can go to Sion to have a nice morning. Sion is a real must to visit. It is a beautiful city with many nice shops and cozy terraces. Because my aunt had bought land around the chalet, a lot of privacy was created. Now you really have the peace and you can enjoy the view without looking inside the neighbors. The ground floor has a bathroom with bath and separate shower. Upstairs is a second bathroom with a washer and dryer. The cost of using the heating is not included in the rent! At check-out Mrs Bournissen will read the meter and will let you mow how much you have used and have to pay. The living room has a fireplace and is equipped with a flat screen, DVD player, video player and a CD player with radio. To make it even cozier, there are movies available, a wide variety of music from classical to lounge and there is a book collection there, should you want to read during your stay. In the living room you will find an open kitchen with a bar. The kitchen has a ceramic hob, oven, microwave and dishwasher (blocks for the machine are free). There are three types of coffee machines present a nesspressomachine, a Senseo coffee machine and a Philips coffee maker with a thermal can, Grind and Brew System, Stainless steel. Delicious coffee starts with fresh ground beans. Easy preparation thanks to the built grinder. The chalet is superbly located near the end of the road leading up from the Evolene valley to Arolla. Be aware that in the winter you really should have snow tyres and chains (although the latter is are a just in case as the road is well maintained and kept clear). La Monta is a small collection of just a handful of chalets, but only 5 minutes drive or a 20 minute walk/snowshoe through the woods to Arolla, where there is a small handy supermarket, a friendly sports equipment shop and a couple of hotels. The chalet is well designed, warm and cosy with lovely touches - in Winter a traditional stone heat source as well as the radiators and a roaring wood burner will keep you warm and cosy. The main living/dining room upstairs has fabulous views of the mountains, including the Pigne d’Arolla and daily visits from some friendly squirrels on the balcony. The two bedrooms downstairs are a good size and the main one leads to a sunny terrace. If you enjoy snowshoeing there are many trails on your doorstep or a brief car ride away. If you like cross country skiing, you can put your skis on by the chalet and join well marked pistes which are groomed daily in season. And a short drive gets you to the downhill pistes at Arolla, which comprise chair and drag lifts and didn’t seem too busy during our stay. We’ve been to the area in summer and keen hikers will enjoy a range of day walks - there’s a couple of refuges in the area open in season if you fancy a night in the mountains. Chalet Bams is a delight. We’d recommend it highly and will certainly return. Thank you very much for this review. While I always try to provide additional services to my clients, it is these comments from those who stay at my chalet that provide good feedback that helps me improve my services . I had a great experience with this family and enjoyed the pleasant discussions that we had. I look forward to hopefully welcome them back again but am very pleased that the family enjoyed my chalet as much as I do when I stay there. Luxurious stay in a quiet house situated at the end of Val d'Herens. In summer this place is ideal for those who looking for peace and quiet in nature and those who like to climb the mountains. The house is very comfortable and well equipped. The owner of the house is helpful and open to the needs of her guests. We spent a very good time in this house. We strive to make our quests stay as comfortable as possible, and we look forward seeing you again. 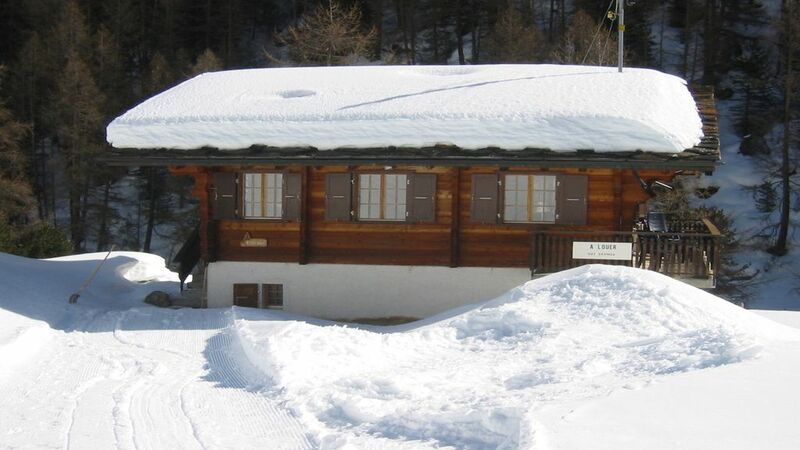 "A very nice and cosy chalet located in a quiet environment. Very well maintained, and good equipped. It is the ideal place to enjoy the nature and come to rest in the mountains." Très beau chalet bien situé un peu à l'égard de la station d'Arolla en retrait de la route dans un petit hameau. Certes, il faut faire un peu de marche entre la voiture garée sur le parking en bord de route et le chalet mais c'est le gage de la tranquillité. Le chalet est posé en hauteur du ruisseau et au bord d'une passerelle suspendue permettant au sentier de randonnée de passer vers l'autre bord du ruisseau. La piste de ski de fond passe entre le chalet et la route ce qui offre de très belles ballades à pied ou à ski. Le chalet offre un très grand confort : équipement très complet (TV avec de multiples chaines, Wifi de qualité, électroménager à profusion, très belle décoration chaleureuse, poêle à bois efficace, joli mobilier, cheminée céramique en bas pour les chambres, douche à l'italienne et baignoire, double WC, terrasse inférieure près des chambres, terrasse suspendue au 1er étage, literie confort, machine à laver et sèche-linge). L'ambiance cosy met à l'aise et permet de profiter du chalet pendant les longues soirées hivernales de ce début mars..
Accueil très chaleureux par Patricia BOUNISSEN et gestion efficace à distance de Marilyn de BOIS, l'une comme l'autre étant soucieuse du bien-être de leurs invités. La station d'Arolla reste très familiale et conserve un esprit rural à l'opposé des stations plus huppées. Le Val d'Hérens offre à deux pas du Chalet de belles découvertes (jolie ballade du Lac Bleu, laiterie coopérative d'Evolène avec de très bons fromages, boucherie des Haudières, supermarché Coop bien garni, restaurants typiques d'Arolla. L'altitude de la station d'Arolla (2000/3000m), tout comme celle du Chalet BAMS (1900 m) permettent de bénéficier d'un enneigement optimal. Il ne nous reste plus qu'à revenir en été ! Merci pour votre belle description de mon chalet et de la région. Je n'aurais pas pu mieux décrire. Il est très agréable de lire que vous avez apprécié vos vacances et j'espère vous accueillir à nouveau dans mon chalet. Mon objectif est que mes invités se sentent chez eux. Et je suis content que cela ait réussi. Wir (zwei Erwachsene und ein Kind) haben 7 Tage, vom 25.12. bis zum 01.01. im Chalet Bams verbracht. Unser Wunsch war eine gemütliche Zeit in einer Berghütte, mit viel Schnee zu haben. Da Arolla auf ca. 2000m Höhe liegt, waren wir zuversichtlich, dass wir Ende Dezember dort Schnee vorfinden warden. Unser Wunsch ist zu 100% in Erfüllung gegangen. Wir fanden ein "winter wonderland" vor mit viel Sonne und überwältigender Landschaft. Das Chalet Bams hat außerdem unseren Aufenthalt perfekt gemacht. Schon im Vorfeld bei der Reservierung haben wir ein sehr gutes Gefühl, dass wir bei Marilyn, der Eigentümerin, sehr gut aufgehoben sind. Das Chalet selbst ist bezaubernd. Es bietet jeden Komfort an. Es ist sehr geschmackvoll eingerichtet und hat einen sehr authentischen "touch". Es liegt an einem kleinen Fluss so, dass man das Wasser hat leicht plätschern gehört. Die Schüsselübergabe hat einwandfrei funktioniert und wie bereits erwähnt, hat uns Marilyn im Vorfeld über alles bestens informiert. Da wir ja Mitten in der Weihnachtszeit in das Chalet eingezogen sind, wurden wir von Marilyn mit einem wunderschönen Weihnachtsgeschenk-Korb überrascht, das uns "umgehauen" hat. Vielen herzlichen Dank dafür Marilyn. Alles in allem: es war der beste Winterurlaub den wir bisher hatten. Danke für die schöne Bewertung. Bin so froh, dass es Ihnen gefallen hat. Ich versuche, alles zu tun, um es meinen Gästen so angenehm wie möglich zu gestalten. Sie waren auch ein netter Gast und ich würde mich sehr freuen, Sie wiederzusehen. Our chalet is not in Haudères or Evolène, but 500 meters higher and be near Arolla. The name of the town is La Monta. La Monta is a small town in the mountains of Switzerland where this cozy chalet is a magnificent view of the valley. Surrounded by mountains and a flowing river near the place is a romantic place a short distance from the center of Arolla and 35 minute drive from Sion. The Chalet is at 1800-1900 altitude is 100 meters from the street. In the summer, Parking in front. The cozy chalet is equipped with all the luxury and located in a very quiet area. In winter this area is ideal for skiing and cross country skiing. There is a cross country ski track 50 meters outside the door and the ski slope is 800 meters from the road. In summer the area ideal for mountain climbing and there are many marked routes for hiking. De borgsom is 500 Euro. De borgsom wordt met het boeken vooruit betaald. De electra kosten kunnen niet verrekend worden met de borg. Ook kunt u de toeristenbelasting niet verrekenen met de borg. Deze dienen beiden bij vertrek bij mevrouw Bournissen te worden voldaan. Borg is alleen voor schade. HomeAway is in het bezit van de borg en zal die terugbetalen als er geen schade gemeld is! Inbegrepen zijn de schoonmaakkosten. Alleen als het chalet niet netjes achter gelaten wordt, zullen er extra kosten voor worden ingehouden. Er is een openhaard aanwezig, en er zal 1 doos hout voor u klaar staan bij aankomst. Hout moet men zelf aanschaffen. Hout kunt u in Arolla kopen of in Evolene bij de Coop. Beddengoed is inbegrepen bij de huurprijs. Elektriciteitskosten zijn niet inbegrepen bij de huur. De meterstand wordt bij aankomst en vertrek opgenomen. Ook is er een toeristen belasting en die kosten zijn:volwassene: Euro 2,30 p.p. per dag, kind (6 t/m 15) : 1,15 CHF p.p. per dag, kind 0 t/m 5 (gratis) en die zijn niet bij de huur inbegrepen. Deze kosten moeten bij mevrouw Bournissen afgerekend worden als u uitcheckt. Deze kosten kunnen niet van de borg afgetrokken worden. Borg is voor schade en die staat op het account van HomAway. Als er geen schade gemeld is stort HomeAway het geld weer op uw rekening.